Even though January 1, 2019 is just another day, a Tuesday as it happens, there is a mental shift we make with talk of newness and, especially in the Southern Hemisphere, after summer holidays have granted us time away from work. Like them or not, this is the time for resolutions. If not to take this opportunity for a fresh start, or a new you, then when? It was for that reason, a few years ago, that I made a resolution to embrace slow fashion at the turn of the new year. It wasn’t really called slow fashion – I just knew I wanted to buy less, but quality and buy sustainable. Good On You has a great description on what slow fashion is: an awareness and approach to fashion, which considers the processes and resources required to make clothing, particularly focusing on sustainability. It involves buying better-quality garments that will last for longer and values fair treatment of people, animals and the planet. I didn’t go all out. 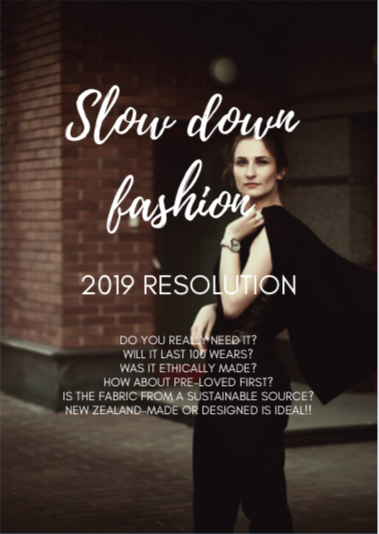 I started with a simple commitment, one small step toward a long term goal – to only buy second hand or sustainably and ethically produced, preferably made in New Zealand, clothing AND less of it, overall. In year one, that simple commitment was to make a more conscious purchase with each garment, investigating where the clothes were made, and asking myself how often I could wear it, would it last more than one season, was this my style? I started slowly with this resolution, as opposed to committing outright to never buying fast fashion ever again because I knew it would be challenging. 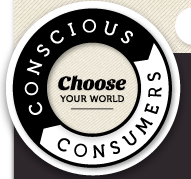 Not only would it require a mindshift, but five years ago the choices of sustainable fashion brands were far fewer than today (check out the A-Z directory of eco friendly NZ brands nowadays). Changing ingrained habits and putting realisation into action is tricky when the allure of something beautiful, trendy and cheap is constantly in your face. New year resolutions come and go with varying success, but I can proudly say slow fashion is one resolution I have stuck to, and built on year after year. Unexpectedly, wonderfully, I gained greater confidence and now truly understand my personal style, I don’t feel like a fashion addict, have an uncluttered wardrobe, spend less for great quality, and love, ABSOLUTELY, love my clothes. Furthermore, I feel good because I pay the true and fair cost of what I buy, wearing guilt-free beauty! 1: I was tired of buying mountains of clothes yet still feeling unsure, awkward, uncomfortable about what I was wearing, or never really nailing my personal style. 2: Over the years I had grown weary of fashion, and how it was made, possibly with child labour, toxic dyes leaching into rivers, genetically modified cotton crops, and or sweatshop conditions. I just knew I had to make small changes to support an alternative clothing model that was also style focussed. 3: I took it easy with my resolution, and set realistic goals. I wasn’t hard on myself for buying something not ethical or sustainable. I’m not hard on myself now either. You are your own judge! I knew it would be a long process. Buying ethical/sustainable can at first seem expensive, so there was no way I could convert my entire wardrobe in a year. I had to change my mind, my wardrobe and put my values into practice over a period of time. After all, it’s slow fashion!! What I discovered in year one? By being mindful about the decision and giving myself time, I could also research more ethical options, or visit second-hand stores. I found that instead of feeling denied, I was enjoying the online browsing and research and thinking about items as investments. What I bought I wore with pride and cared for more. I still delight in those mindful purchases as opposed to feeling that initial rush of bagging new bargains only to feel deflated a day, a week or a month later when the clothes don’t fit, fade or degrade all too quickly. Or indeed, the classic – falling for a trend, but looking ridiculous. I never feel ridiculous now, or like I’m trying to follow anyone. If this resonates with you, here’s a handy checklist to get you started. 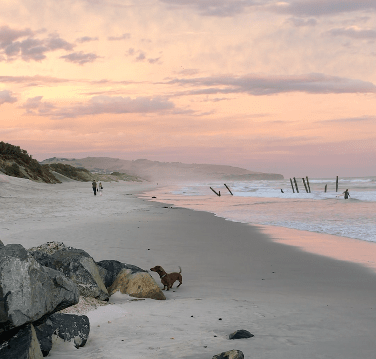 Thanks Canva for the background image! Do you need it, will it last 100 wears, it is ethically made from a sustainable source, and have you considered pre-loved options first? Of course, buying locally-made is ideal! Since then I have made many resolutions with regard fashion, such as mending my clothes (or having them mended, resoled etc); wearing only 6 items for 6 weeks; wearing around 30 items per season in a capsule wardrobe; emailing fashion brands and asking them to improve their supply chain; writing about my findings. It’s all a journey, and for me it started with a New Year Resolution that was just a small ball set in motion.